Just so we’re clear, this isn’t really a food or travel blog. It’s more a place where I can keep my photos and impressions. A kind of pensieve, if you will, because I have such bad memory. But since this is a public blog, I’ve consciously been using more “I”s in my writing, as opposed to the more neutral magazine feature style that I’m used to. I have a list of things to write about, and have, these last few days, been focusing on my trip to Pagudpud, which started with being stranded in the middle of a deserted highway on a dark, rainy night, to enjoying a quiet stay in a resort in what feels like the edge of the world. Now, I’d like to write about the most exciting part, the main reason I travel, and the biggest factor in picking where I go next: food. All my free time in Pagudpud was spent in Kapuluan Vista Resort, which is far from any eating establishments. Fortunately, it has its own restaurant manned by a friendly, fairly efficient, laid back staff, that serves decent meals at Makati prices. Considering that this is a beautifully maintained resort that’s hard to get to, it’s quite reasonable. When you arrive, you get a welcome drink of the resort’s famous (everyone I asked told me to order it) Alma’s Margarita (Php75 if you order it ala carte), or some non-alcoholic drink that I forget. 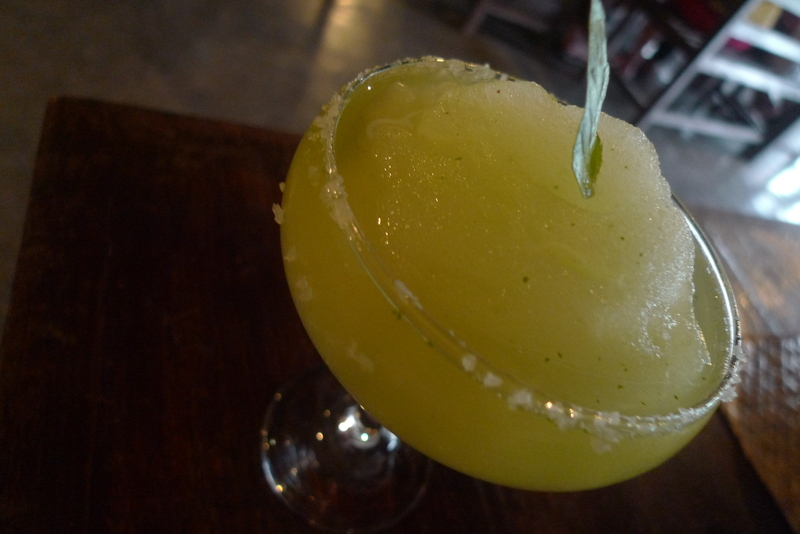 The margarita is a sweetish citrusy slush that gives you just enough of a buzz (take note that I have very low alcohol tolerance). A good way to start a vacation. Each night’s stay comes with a plated breakfast. I managed to try most, if not all of the selections. 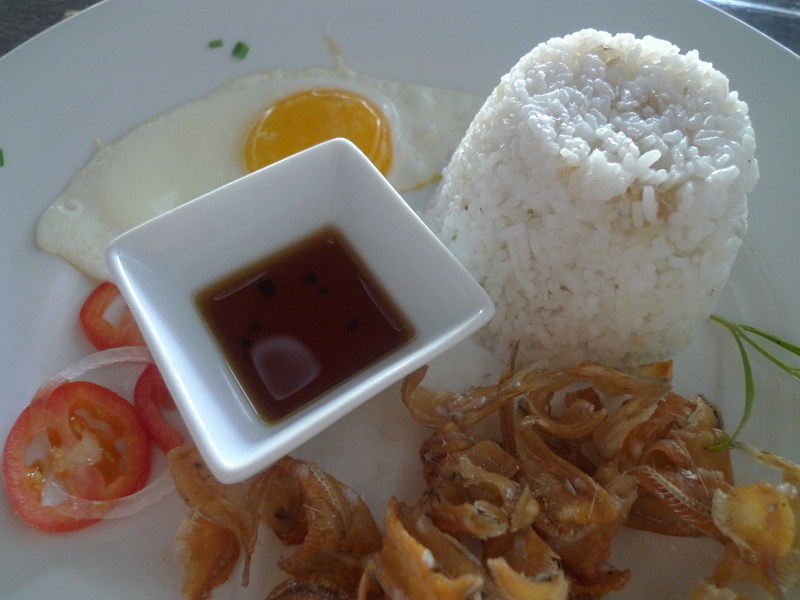 The Dried Fish (Php200 ala carte) is fried dilis (anchovy) served with steamed rice, fried egg, fresh tomatoes and onions and a vinegar-based dipping sauce. The dilis aren’t marinated with anything strong, so you get to enjoy their crisp flavor. Of all the breakfast choices, this one is the lightest on the belly. I’m not a fan of longganisa, or of sausages in general, but since every province seems to have a longganisa specialty, I make it a point to try it. 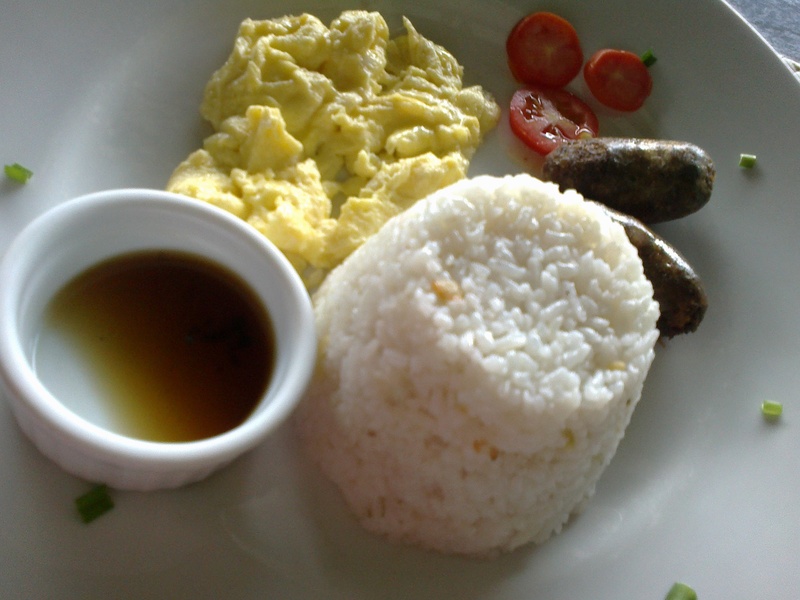 Ilocos Norte is known for its longganisa, which has a lot of garlic and not so much fat, so if you’re in the area and want to try some, they offer it in the longsilog, the longganisa, steamed rice and fried egg combo that is a breakfast staple almost anywhere you go in the Philippines. 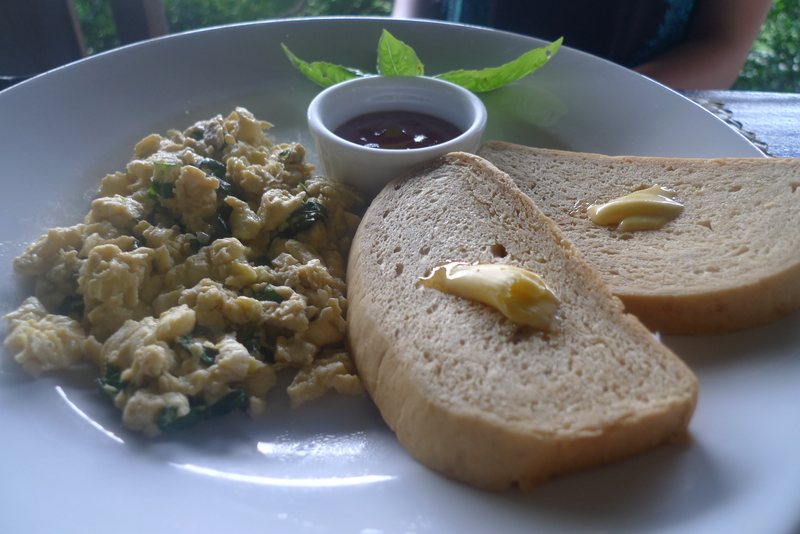 Not leaving out the octo-lacto vegetarians, Kapuluan offers the Basil Scrambled Eggs (Php200). This may not look like much, but the dish is deceptively filling. More filling, I daresay, than the dried fish! The eggs are well done but not rubbery, with an herby taste imparted by a generous amount of basil mixed into it. The homemade bread is dense, almost cake-like, with a certain sweetness. Unfortunately, it is served with margarine (there doesn’t seem to be any butter on the premises). Still it makes for a filling meal. I really love this resort, and I love the restaurant in it, but I will tell you to stay away from the brewed coffee (Php40), which does not taste good. It tastes like what dirt probably tastes like if I scooped up a handful from the ground and brewed it. You’re better off bringing your own coffee and having them brew it (I don’t know if this is allowed, but they’re pretty nice, and might say yes), or bringing a 3-in-1. If you are going to suffer with a 3-in-1, I recommend the Kopiko Brown Coffee, which is by far the best of its kind in the Philippine market. It has an intensely smokey flavor and none of the tinny aftertaste that other 3-in-1 instant coffees have. Now, breakfast isn’t the only meal in the day. Since I was in Ilocos Norte, I had to try the Bagnet (Php350), the super crispy fried pork belly that the province is famous for. 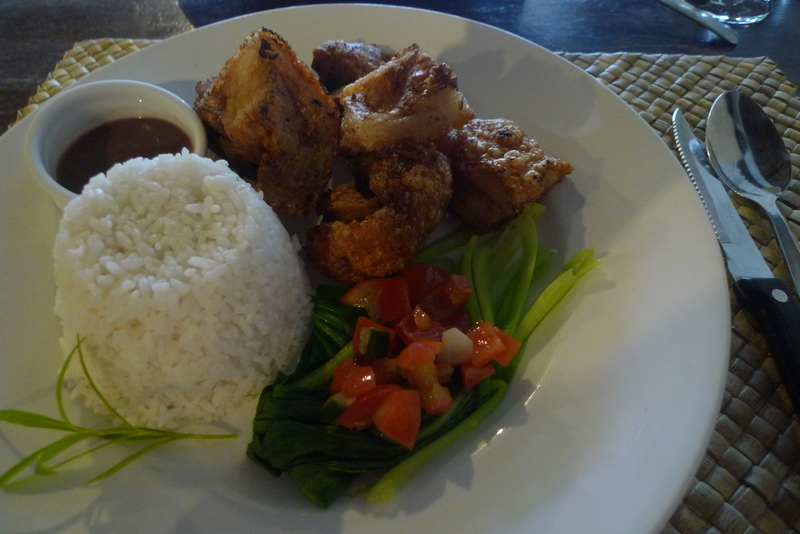 It is supercharged crispy pata (okay, different pig parts, but still). It is liempo on steroids. It is a heart attack waiting to happen. Kapuluan’s bagnet is more chicharon than bagnet, with some parts a bit tough, but everything crunchy. And they give you a lot of it too, making the dish big enough to share. After all, it is just wrong to eat that much fried pork in one sitting. Not that I will judge or blame you if you did. Besides, it comes with a native salad, which you can use to make yourself feel better about indulging in something so deadly. 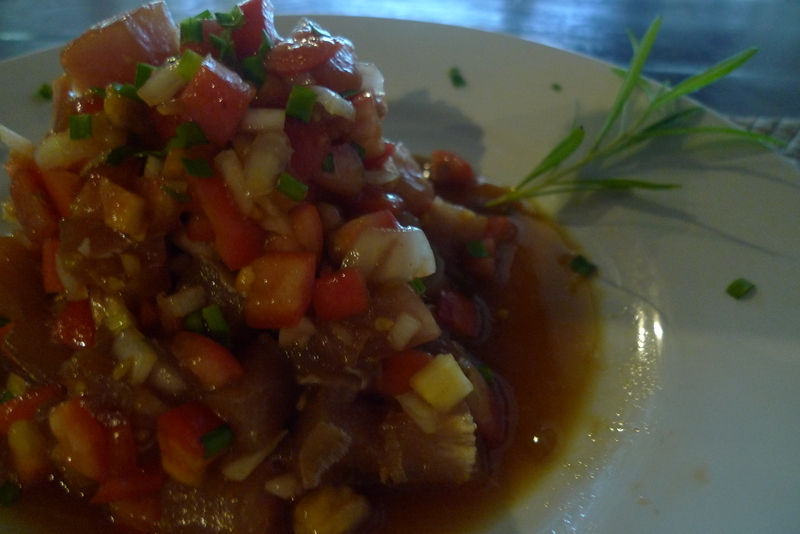 My favorite, though, was the Kapuluan Kilawen (Php300), a huge dish of raw fish marinated in tomatoes, onions, herbs and vinegar. This serving is huge, and is best to share. The fish is fresh, and the marinade gives it a bit of bite. It is also worth mentioning that the restaurant plays excellent music. No overused reggae or bossa nova tracks here. It’s mostly a lot of laid back music that ranges from The Beatles to Tori Amos. In a word, paradise.